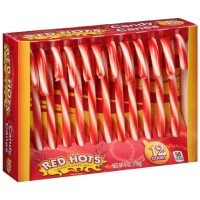 Spice up the holidays with Ferrara Red Hots Candy Canes! 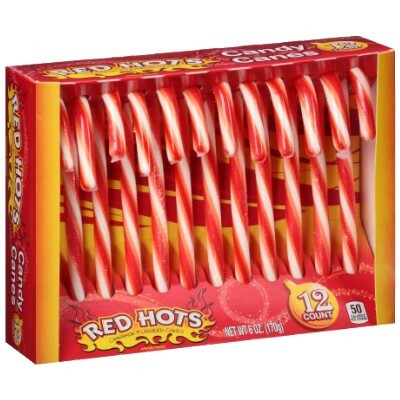 This pack of 12 US candy canes are full of cinnamony Red Hot flavor. Not only are they fun to eat, they add a little zing to all your festivities. So stuff them in your stockings, stick them on your tree, or even dress up your gifts with these spicy sweet candy canes. Enjoy a box of Red Hot Candy Canes this holiday season! Corn syrup, sugar, artificial flavor, colors E129*-E110*. *May have an adverse effect on activity and attention in children Contains GMO. Nutrition facts (for 100g): calories 357Kcal, total fat 0g (saturated fat 0g), total carbohydrate 100g (sugar 64.3g), protein 0g, salt 0.2g.